In an atomic research lab, the dangers of the work make the technicians nervous, leading to an accident. A scorpion gets dosed with radiation, and grows to deadly proportion. A hypnotist, brought in to help the nervous technicians, defeats the monster. 7 pages. 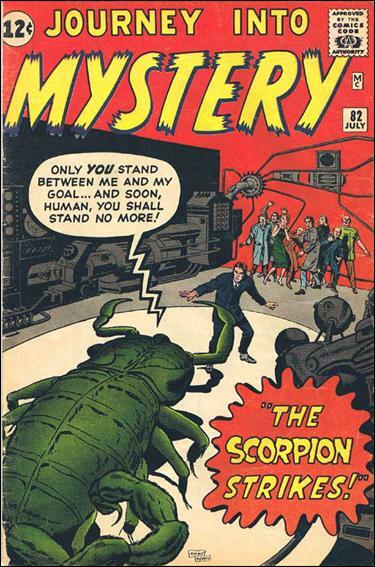 Reprinted in Journey Into Mystery (Vol 2) #7. "I Am a Prisoner of the Voodoo King!" A criminal on the run from the law in the jungles of Africa stumbles across a voodoo tribe worshiping a golden idol. He soon finds the idol's curse, that once grasped, it can never be released. 6 pages. Reprinted in Chamber of Chills #7 and Fantasy Masterpieces (Vol 1) #3. Two chair designers vie for commissions, but Gorgi Gruff is only an imitator, while Adam Able makes uncommonly comfortable seats. Gruff holds Able at gunpoint for the secret of his designs, but Gruff gets much more than he bargained for. 5 pages.